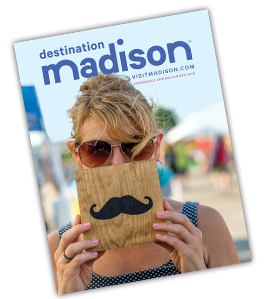 It’s easy to find free things to do in Greater Madison! Our area is graced with five sparkling lakes and stunning landscapes that lend themselves to endless hours of outdoor fun. Plus, playing home to the state capitol and UW-Madison campus creates amazing amenities that you can take advantage of any day of the week. Scroll to see an array of ways you can spend little—while seeing a lot—in our city. Stroll through 16 acres of breathtaking outdoor display gardens featuring the ornate Thai Pavilion—the only one in North America and only one in four pavilions located outside Thailand. Step inside Olbrich Gardens indoor garden space, a glass pyramid that reaches to 50 feet tall and is filled with exotic plants, bright flowers, a rushing waterfall and free-flying birds. Explore the Arboretum&apos;s 1,200 acres on your own or schedule a private guided tour. The Arboretum features gardens, ecological communities including woodlands, savannas, prairies, and wetlands, and 20 miles of trails designated for hiking, biking, skiing and snowshoeing. In total, there are more than 200 miles of biking and hiking trails in the Madison area. Discover the best trails for your type of fun, from hiking to mountain biking, in the city or around surrounding towns. When you visit Madison, you&apos;re almost always a stone&apos;s throw away from the nearest lake. There are five in the vicinity and more than 15,000 acres of water available for your adventures! Enjoy a free evening of dancing and great music with friends! Concerts on the Rooftop features spectacular local bands accompanied by the best views in the city! Wisconsin’s stunning state capitol building is the only one in the country with a granite dome and is designated a National Historic Landmark. This building is home to the State Legislature, Supreme Court and Office of the Governor, and features ornate mosaics, marble and more. This mansion was built in the Classical Revival style on more than four acres along Lake Mendota. It has 16,000 square feet of living space, including 34 rooms, 13 bathrooms, seven bedrooms and several fireplaces. The Dane County Farmers&apos; Market is held every Saturday morning around the Capitol Square from April through November. It is the largest producer-only farmers&apos; market in the U.S. and provides a chance to chat with more than 300 vendors who offer produce, flowers, cheeses, meats and more. The winter market is held at the Monona Terrace in December and the late winter market is held at Madison Senior Center from January through April. Don&apos;t miss the Taste of the Market Breakfast cooked up each week by a different local chef. Pack a picnic, place your blanket on the Capitol lawn and enjoy music from the Wisconsin Chamber Orchestra. Each season features guest artists and guaranteed good time. Situated on the shores of Lake Mendota on the UW-Madison campus, this is one of Madison’s most popular locations to listen to music and enjoy sunny days. The Terrace recently underwent a remodel that expanded the seating and upgraded the stage–there are a dozen ways to enjoy the new Terrace! This modern and contemporary art museum was designed by world-renowned architect Cesar Pelli and provides learning opportunities for audiences of all ages, including exhibit openings, film screenings and special events. The Veterans Museum highlights important events in Wisconsin military history, from the Civil War to the present. Includes amazing artifacts exhibitions and a functional submarine periscope. Browse the rocks and minerals exhibit, which features meteorites and a fluorescent display, or check out the dinosaur and fossil exhibits. Explore self-guided or via tours and storytelling times. The Chazen Museum of Art is associated with the University of Wisconsin-Madison and houses touring and permanent collections from ancient times to the present day. Docent-led tours are available. The Henry Vilas Zoo is home to more than 800 animals and is one of the nation&apos;s only admission-free zoos. The Arctic Passage exhibit features seals, polar bears and grizzly bears and the zoo&apos;s carousel and train are also popular with kids of all ages. The library&apos;s new downtown location is directly across from Overture Center for the Arts, and is much more than a library! Kids will love the unique reading nooks and The Bubbler, an artist&apos;s studio that will allow your child&apos;s imagination to grow. This museum is full of information about the state&apos;s rich history: its heritage, cultures and shared experiences. Learn more about the Native Americans that inhabited Wisconsin 1,000 years ago, to modern-day residents that call Madison home. Almost every Saturday during the school year, Overture Center for the Arts offers free programs and performances designed for children and families. These arts activities feature a diverse lineup of local and regional musicians, storytellers, jugglers, theater troupes, magicians and dancers. Presented by American Family Insurance (a Madison-based company), the DreamBank offers a variety of interactive tools, activities and weekly events that help you discover your goals and inspire your children.